With a strongly growing economy and rising electricity demand, Brazil’s traditional reliance on hydropower has become unsustainable. The deregulation of the Brazilian power industry has created opportunities for privately owned power generators. 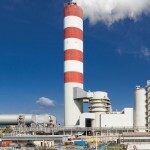 MPX Energia has recently constructed three coal fired thermal power plants (TPPs) in Brazil’s Northern coastal areas. Pecém I, a partnership between MPX and EDP, consists of two 360 MW units. Pecém II and Itaqui each have one 360 MW unit. The power stations are located close to the coastline, allowing the use of imported coal. The combined four units at the three stations use a dry flue gas desulphurization system to reduce SO₂ emissions. The flue gas entering the chimneys has a temperature of 67 °C, which is well below the sulphuric acid dewpoint. Consequently, the internal surfaces of the chimneys must be resistant to sulphuric acid condensate. To achieve both low construction cost and excellent long term durability, the four 360 MW units at the Pecém I, II and Itaqui power stations have each been equipped with their own individual chimney, built in accordance with Hadek’s New Chimney Design. 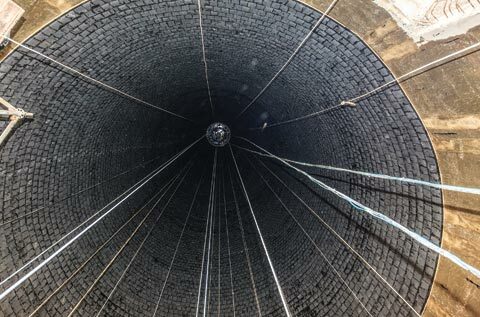 The New Chimney Design, which is increasingly favored by power station owners worldwide, is a concrete chimney that is protected by a PennguardTM lining applied directly to its internal surface. The Pecém I station uses two 110 m high chimneys. Pecém II has one 150 m high chimney. Itaqui power station uses a single, 110 m high chimney. 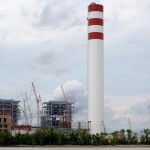 The four chimneys combined, required a total of 7.926 square meters of PennguardTM linings. Four units, four chimneys. Why the New Chimney Design (“NCD”) offers the Pecém and Itaqui power stations the lowest investment cost as well as the highest reliability. An NCDTM chimney does not use an internal flue. 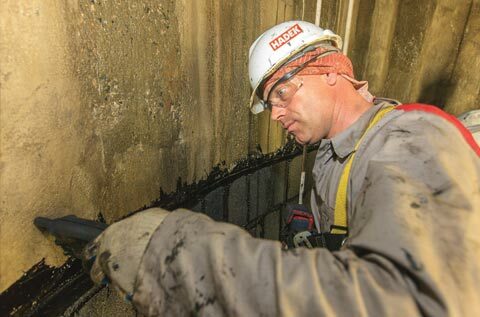 The PennguardTM lining is applied directly to the internal surface of its concrete shell. NCD chimneys are relatively slender, which results in a reduced mass of reinforced concrete. Because of its design simplicity, an NCD chimney is completed more quickly than similar sized, traditional chimneys that incorporate internal flues. Furthermore, the construction “laydown area” for NCD chimneys is far smaller. 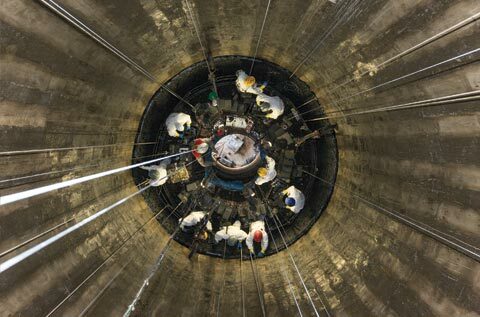 The civil construction division of Brazilian company ICEC completed all four NCD chimneys well before any of the other, major components of the power station. By using one NCD chimney for each 360 MW unit, Pecém I power station has reduced the combined length of its FGD outlet ductwork. Instead, relatively short FGD outlet ducts are connecting the FGD and chimney of each unit. Typically, the much longer ductwork that would be needed for a combined, multi flue chimney would be far more expensive. A 30 year track record demonstrates that PennguardTM linings offer excellent durability and performance. Hadek’s systematic approach to Quality Assurance ensures that every installation meets the highest standards of quality, so that each PennguardTM lined chimney will be virtually maintenance free over many years of operation. In recent years, around 20 NCD chimneys have been constructed and succesful operating experience is being gathered under a range of service conditions. PennguardTM linings are highly reliable and most owners find that their PennguardTM lined chimneys require very little or no maintenance or repair. Nevertheless, owners are also keen to monitor the condition of their PennguardTM linings, allowing them to plan in advance for any localized repair that might be needed. Thermal imaging technology has now developed to such a high level, that it offers the option of checking a PennguardTM lined chimney during operation. Using a special thermal imaging camera, the operator can easily identify any spots on the outside of a chimney flue, or an NCD chimney, that are slightly warmer, perhaps indicating a localized weak spot in the lining. The photos on this page show a regular photo of a PennguardTM lined concrete chimney in operation, as well as a thermal imaging photo taken from the same position. 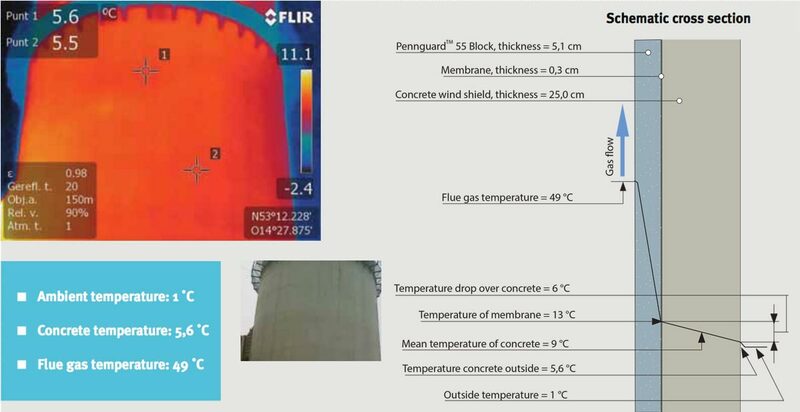 The thermal imaging photo shows a uniform temperature of the concrete shell, confirming that the PennguardTM lining is in good condition.